One of my reading goals for 2015 is to "read something of a religious nature." There were so many books I could have read for this goal, but I ended up not even considering most of my options but settled almost immediately on this book, which I've wanted to read for many years. C.S. Lewis has always been a favorite of mine, and not just because he wrote The Chronicles of Narnia. I like him because he almost sounds like he could have been a member of my faith, but he wasn't. His ideas about God's grand plan for each of His children resonates deep within me as something that's true and echoes the foundational doctrines of my church. I also like him because he has a very similar style to Elder Neal A. Maxwell, one of my favorite Apostles who passed away in 2004. Both of them knew exactly how to turn a phrase for maximum impact and also came up with some deeply clarifying analogies. Before beginning this book, I didn't realize that it is actually more of a transcribed talk than a book. C.S. 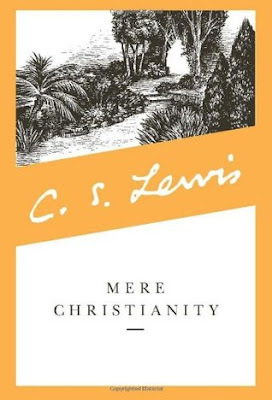 Lewis gave it over the air in the 1940's and changed very little of it when it was published in this format. Consequently, it has a very conversational and casual tone to it. He addresses the reader (or, when he gave it, listener) frequently, and it makes what he says feel very personal and applicable. This book addresses the related questions, "What does it mean to be a Christian?" and "What does a Christian look like?" It doesn't focus on any particular religion but instead discusses Christianity in a very broad, non-denominational way. It is for anyone who either identifies himself as a Christian (and as a Mormon, I do) or is curious about what goes into being a Christian. I'm going to do something I don't normally do in reviews and just hand out a few of my very favorite quotes from the book. I hope you'll indulge me. These are the one that made me stop and think. These are the ones I especially don't want to forget. "Reality, in fact, is usually something you could not have guessed. That is one of the reasons I believe Christianity. It is a religion you could not have guessed. If it offered us just the kind of universe we had always expected, I should feel we were making it up. But, in fact, it is not the sort of thing anyone would have made up. It has just that queer twist about it that real things have." "Enemy-occupied territory--that is what this world is." "I am trying here to prevent anyone saying the really foolish thing that people often say about Him: 'I'm ready to accept Jesus as a great moral teacher, but I don't accept His claim to be God.' That is the one thing we must not say. A man who was merely a man and said the sort of things Jesus said would not be a great moral teacher. He would either be a lunatic--on the level with the man who says he is a poached egg--or else he would be the Devil of Hell. You must make your choice. Either this man was, and is, the Son of God: or else a madman or something worse . . . But let us not come with any patronising nonsense about His being a great human teacher. He has not left that open to us. He did not intend to." "They are told they ought to love God. They cannot find any such feeling in themselves. What are they to do? The answer is the same as before. Act as if you did. Do not sit trying to manufacture feelings. Ask yourself, 'If I were sure that I loved God, what would I do?' When you have found the answer, go and do it." "And that is precisely what Christianity is about. This world is a great sculptor's shop. We are the statues and there is a rumour going round the shop that some of us are some day going to come to life." "When you come to knowing God, the initiative lies on His side. If He does not show Himself, nothing you can do will enable you to find Him. And, in fact, He shows much more of Himself to some people than to others--not because He has favorites, but because it is impossible for Him to show Himself to a man whose whole mind and character are in the wrong condition. Just as sunlight, though it has no favorites, cannot be reflected in a dusty mirror as a clean one." "I find I must borrow yet another parable from George MaDonald. Imagine yourself as a living house. God comes in to rebuild that house. At first, perhaps, you can understand what He is doing. He is getting the drains right and stopping the leaks in the roof and son on: you knew that those jobs needed doing and so you are not surprised. But presently He starts knocking the house about in a way that hurts abominably and does not seem to make sense. What on earth is He up to? The explanation is that He is building quite a different house from the one you thought of--throwing out a new wing here, putting on an extra floor there, running up towers, making courtyards. You thought you were going to be made into a decent little cottage: but He is building a palace. He intends to come and live in it Himself." Sorry. Very quote-heavy, I know. Just be grateful I didn't quote more because there is actually very little in the book that isn't quote-worthy. I loved this book. It deepened and strengthened my faith. It helped me look at some of my doubts and struggles in a new, illuminating light. It buoyed me up and made me grateful for the foundation of my religion. My search for knowledge is far from over, and as I continue to read and study and pray, I am comforted by this thought from Lewis: "When you have reached your own room, be kind to those who have chosen different doors and to those who are still in the hall." I think in many ways I am still one of the ones in the hall. There are many things I am uncertain about, and I have many unanswered questions. But I have the faith to keep moving forward, exploring rooms one by one, with the bright hope that one day my faith will be secure and unshaking. In the meantime, I will do my best to live the life of a Christian and follow the example of my dear Savior. This is one of my favorites, as well! I read it for Book Club a couple of years ago, and loved it!